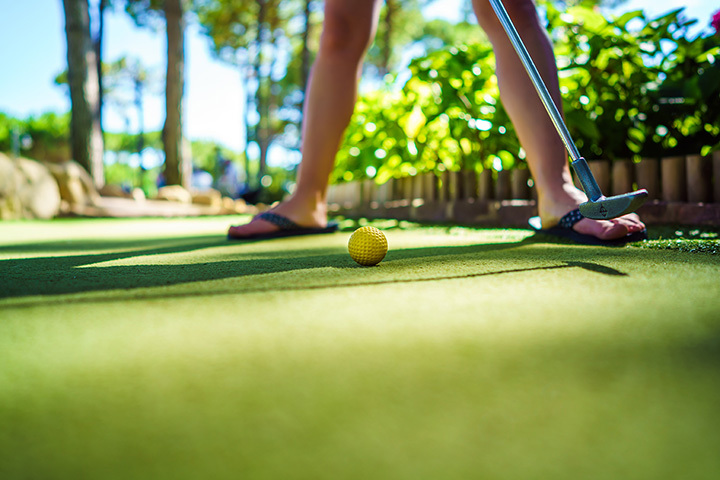 The 9 Best Mini Golf Courses in Arkansas! You’ll find countless miniature golf courses here in Arkansas where you’ll battle fun obstacles like windmills, water, and even some gators. While many of these courses are good, we want to bring you better than good. Check out our picks for the best places for mini golf in the Natural State. This mini golf course is a jungle adventure! If you’re from the Fort Smith area then you’re familiar with Ben Geren Regional Park. Ben Geren’s Gator Golf is a championship course featuring 27 holes, the only one of its kind in this area. Funtrackers Fun Center & Volcano Falls in Hot Springs has been providing fun and adventure for the whole family since 1998. This challenging 18-hole mini golf course features blue waterfalls, running creeks, and a huge volcano. Pirate’s Cove, the original adventure golf, features swashbuckling fun in a wholesome, family-oriented way. This award-winning mini golf course features two 18-hole courses with an 18th century buccaneer theme. You’ll love this outdoor mini golf course in Northwest Arkansas. Golf Mountain Mini Golf features two 18-hole courses combined with a botanical garden vibe. These challenging courses feature sudden dips, bumps, waterfalls, and more. However, with golf balls that float, even novice mini golfers can overcome the water hazards. Turn your game on with blacklight mini golf! Just like its name says, this is a real glow-in-the-dark miniature golf course. Glowgolf is located next to Old Navy in the Pinnacle Hills Promenade. Putting memories into motion, Lokomotion takes mini golf to a whole new level. These beautiful courses are expansive and somewhat challenging. Lokomotion offers a great spot for families to enjoy the great NWA outdoors together. “Come putt with us” at this great mini golf spot on College Avenue in Fayetteville. With authentic African animals and magnificent waterfalls, Gator Golf is really a unique experience the whole family will enjoy. Gator Golf features two 18-hole custom designed courses. Get away from the city streets and enjoy this family fun spot in Cabot. Cabot Mini Golf features a beautifully landscaped 18-hole course that is well lit and all weather, making it a great place to play mini golf throughout the year. If you’re in the Central Arkansas area, the Big Rock Mini Golf is the place to go for BIG fun. Big Rock features two 18-hole courses, with nine handicap-accessible holes on each course.